Ride Along is something of a normality in the world of comedy. It is perfectly packaged, with standard jokes ensured to offend no one and completely appealing personas playing two archetypes that are sure to be so familiar to general audiences that they will settle right in and enjoy this brief, hour and a half comedy that keeps the laughs and action well balanced while carving out just enough of a niche for Kevin Hart while demonstrating his ability to play a fully formed character rather than just the comic relief. There is nothing terrific or substantial about the film and in fact it is rather sub par in many areas for despite the fact it is competently directed by veteran Tim Story (Barbershop, Fantastic Four) it displays no sense of style or wit beyond that of the typical Hollywood production with enough cash to back its story but not enough actual story or jokes to sustain the simple quotas we ask for from our most commonplace films. 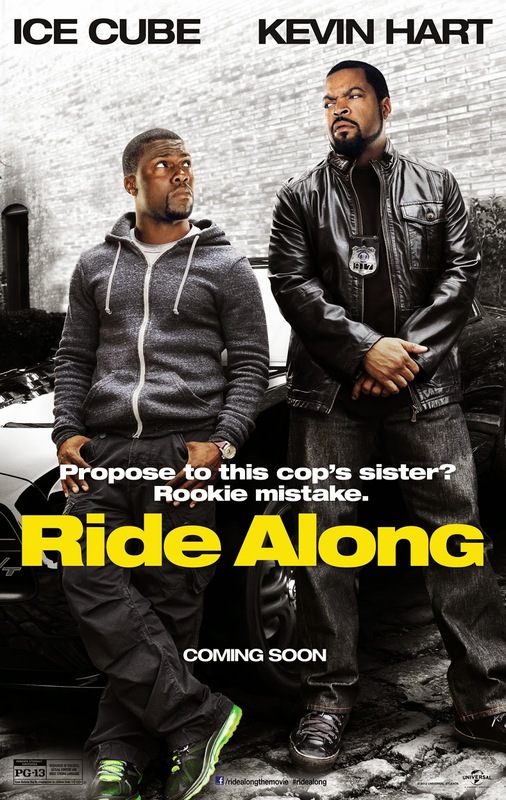 That is what Ride Along is after all: a film put together by a committee to appeal to as many people as possible in hopes of creating a bankable star in Kevin Hart that will allow them to roll out films year after year with thin premises, little to no imagination in the script while trusting that the on-set riffs and improvisations are enough to satisfy our need for laughter. In short, if everything goes according to plan Hart will turn out to be the next Adam Sandler (who is now experiencing a slight downfall) and the studios distributing and financing these slapdash efforts will have someone on hand that is a sure bet. Ride Along will be that solidifying film for Hart and he does fine with what he has to work with here making the most out of the otherwise dry material. There are movies like this, movies so obviously put together by a board room that I can't buy into it and I'm unable to get past the fact I'm not seeing a specific vision of what this story was supposed to be, but rather a combination of several ideas with only the intention of pleasing as many people as possible to get the biggest profit. I typically can't take films like this and while I understand these kinds of films aren't made for critics or true cinema fans, but despite all of that this commonplace comedy that has five writers names attached to its screenplay and a director who seems to be on autopilot I didn't mind what Ride Along had to offer even if it was nothing more than a brief diversion. 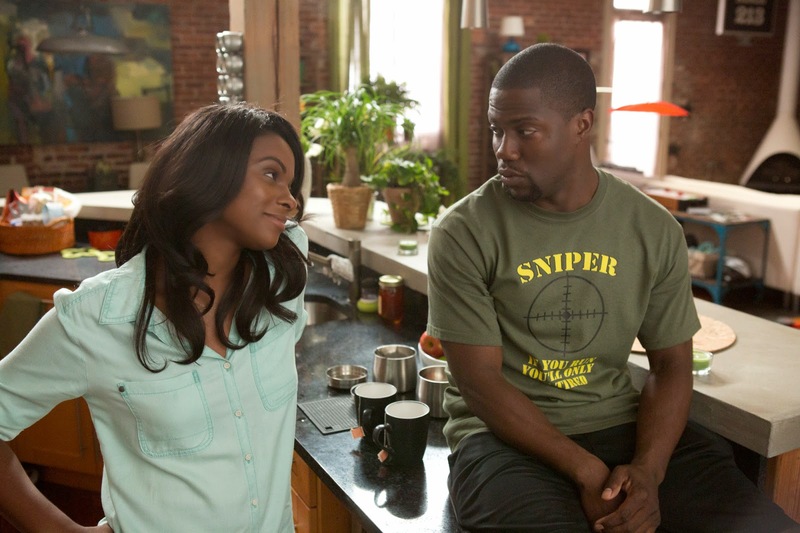 Angela (Tika Sumpter) tries to uncover her boyfriend, Ben's (Kevin Hart), fascination with video games. If you've seen the trailer you can basically guess how the film is going to play out. Ben Barber (Kevin Hart) is a pint-sized security guard at a local high school with bigger aspirations of joining the police force. He is in a great relationship with a beautiful woman named Angela (Tika Sumpter) though it is unclear how they live such a comfortable lifestyle when she doesn't seem to work and his only income is from the aforementioned job the high school kids ridicule him for. The conflict comes in when Ben is ready to propose to Angela, but before any of that can go down Angela wants Ben to seek the approval of her brother, James (Ice Cube), who just so happens to be the toughest detective in all of Atlanta. Naturally, James is annoyed by Ben and doesn't think he has what it takes to 1) marry his sister and 2) be an actual cop. When Ben finally musters up the courage to ask James if he would allow him to ask for Angela's hand in marriage James is all but ready to kick him to the curb, that is, unless little Ben can prove himself. How might Ben do this you ask? Well go on a ride along of course! Zing! From here the hilarity should ensue as the chemistry between Ice Cube and Hart should make for some outlandish exchanges yet nothing feels particularly great or sticks with you. James takes Ben out with the intention of showing him how tough the job actually is and that he isn't cut out for this kind of work, even though he gives the dispatcher specific instructions to load him down with 126's which is apparently cop code for annoying, irrelevant issues that no one else wants to deal with that are usually reserved for rookie cops anyway. This sends James and Ben on such outings as dealing with biker gangs parked in handicap zones and crazy guys at the farmers market throwing produce everywhere. It all has potential, but none of it really pans out and the fact we have to buy that Hart's character is inadvertently stumbling across clues for the bigger, illegal arms deal case that James has been working on for years and that it all comes crashing down the day he decides to take Ben out is more than a bit ridiculous. We don't ask our comedies for reality though and thus is the reason much of the ridiculous plotting included in Ride Along didn't bother me. I just decided to take it as it was and go with it. What we do need from our comedies, especially those designed to give everyone a laugh, are funny jokes and strong, comical performances that make us believe these people, these comedians can be funny in everyday situations and that they can actually play out the scenarios they typically reference when performing stand-up. It is in this vein that I hoped Hart would begin to approach his leading man roles. While he is still playing co-lead with Ice Cube here this is by far the most headlining gig in a feature he's had to date. Whether it be Think Like A Man, This is the End, Grudge Match or the upcoming About Last Night it always seems the makers of each film simply allow Hart to come in periodically and do his thing rather than giving him a fleshed out character with a full-on personality to portray. This might be less true about next months About Last Night and he was playing himself in This is the End (but I'd rather mention that than the countless parody/Scary Movie spin-offs he's appeared in) but Story, who was likely the most guilty of this as he also directed Think Like A Man redeems himself here by having Hart play a guy who isn't just the fast-talking funnyman who is able to deliver life lessons and funny lines through his distinct storytelling abilities, but goes from one end of the emotional spectrum to the other (okay so maybe not all the way, but with a bigger range than usual) as he has to deal with the dual stress of both impressing his girlfriends brother and that which is naturally brought on by the nature of the job. For the first half of the film we get the Hart we expect, the funny guy who has no worries in life and embraces every obstacle with a casual nature as if nothing can disrupt his outlook on life. It is when Ice Cube's character finally presents him with this out and out challenge in that he truly doesn't believe Hart's character will make it through the Police Academy (of which he has just recently been accepted) that Hart's Ben changes gears as does his performance. This is all well and good for serving as to how far Hart's talent stretches, but what it fails to do is consistently provide those laughs we came in looking for. 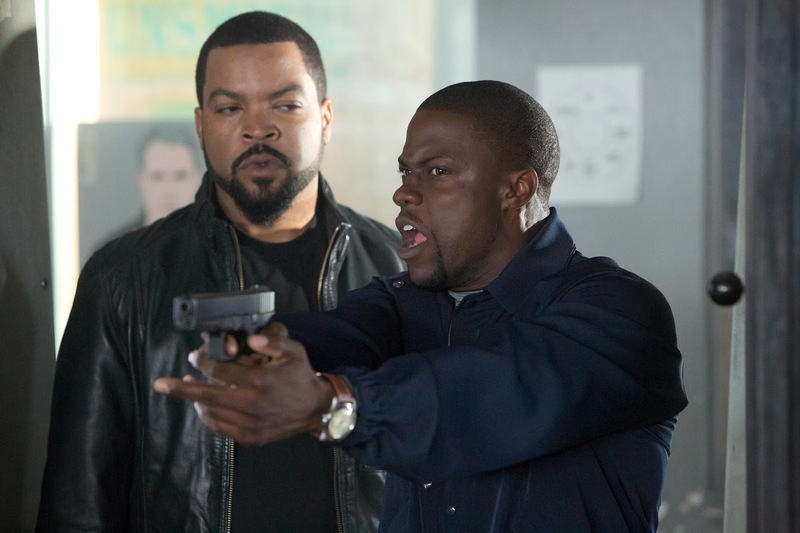 Detective James Payton (Ice Cube) is more than irritated with his soon-to-be Brother-in-Law in Ride Along. Ride Along is funny enough. It gets by on the humor that Hart's motormouth and quick wit bring to its thrown-together plot and Ice Cube's ability to mean mug every time he lets a line loose doesn't hurt either, but that magic chemistry you look for in these kinds of films just doesn't seem to be clicking. In the vein of 48 Hours, of Bad Boys, of Rush Hour and even of 21 Jump Street there has to be this undeniable play between the two leads that make us want to see them together (whether it be getting on each others nerves or working together) just as much as if not more than the resolution of whatever plot to destroy the world or drug deal they are trying to stop. While there are hints of it here, especially in the scene where Ice Cube takes Hart's easily intimidated Ben to a shooting range and Ben does all he can to prolong actually firing a real gun. There is a moment there where I let out a bit of genuine laughter, where I saw how this could go especially if it gets a sequel (and it will) and these two inevitably become partners. That will be the more interesting film, putting these guys on a level playing field, while here they are just hitting the beats of every other buddy cop film that has come before them with not enough genuine laughs along the way to make for an excuse as to why we should waste our time on this. With all of the aforementioned titles above it is clear both general audiences and even critics are willing to forgive the tired cliches that come with the buddy cop movies as long as there is appeal and charisma in the casting and pairing of the two leads. While on paper the combination of Hart and Ice Cube would seem like a no-brainer it simply doesn't translate into immediate gold. As I've said countless times throughout this review, the film is good enough, it gets by, it makes due, but it doesn't stand as the one people will go to when they are bored and want to distract themselves for a few hours as I would easily go with any entry in any of the franchises above before re-visiting Ride Along. And so, if the point isn't clear enough this is not a bad movie it is just nothing more than a lazy one that uses supporting players like John Leguizamo, Bryan Callen, Bruce McGill, Laurence Fishburne and Jay Pharoah to up the comedy quotient while their characters, like the leads, do nothing more than stay flat on the hurried page instead of welcoming us into this partnership.